The actor-turned-politician hit out at the BJP leadership, alleging there's no place left for dialogue in the BJP anymore and the party's top brass "doesn't value its own people and views opponents as their enemies". 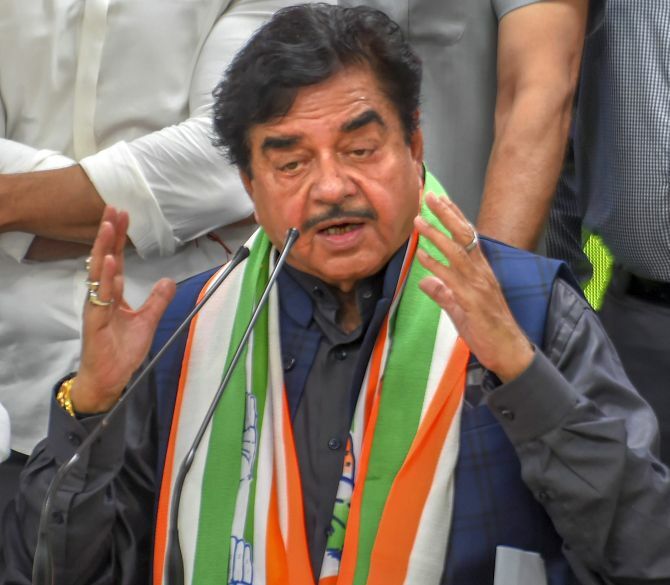 Dissident Bharatiya Janata Party MP Shatrughan Sinha on Saturday joined the Congress, which welcomed him with a Lok Sabha ticket, as he lambasted his former party, terming it a "one-man show and two-men army". The 72-year-old actor-turned-politician said he left the BJP, on its foundation day on Saturday, with "immense pain and heavy heart". He alleged there is no place left in the party for dialogue and its leadership does not value its own veterans, and views its opponents as "enemies". Sinha also heaped praise on Congress president Rahul Gandhi. He is a dynamic, "tried, tested and successful" leader and the face and future of India, the Patna Sahib MP said. 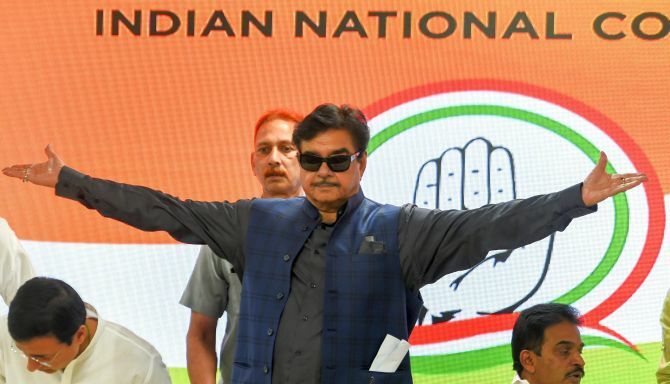 Within hours of joining, the Congress fielded Sinha from Bihar's Patna Sahib seat, where he will contest against BJP leader and Union minister Ravi Shankar Prasad. Sinha had met Rahul Gandhi on March 28. Attacking the BJP's top leadership, Sinha said, "Today there is no place left for dialogue in the BJP anymore," and if one speaks the truth he is termed as a rebel. "If speaking the truth is rebellion, then I am rebel," he said addressing a press conference at the Congress headquarters. Party veterans are not being looked after in the BJP and are being sent to 'margdarshak mandal', he alleged. "In the BJP, democracy has slowly and surely turned into dictatorship. The party has become a one-man show and a two-men army," Sinha alleged without naming anyone. He claimed whenever he tried to make a point, he was called a "traitor". That Sinha was not happy with the BJP and the government led by it was clear from the past few months, during which he put out several tweets critical of Prime Minister Narendra Modi, the party and the government. In his tweets, he has also been full of praise for Gandhi and Rashtriya Janata Dal leaders, including its jailed president Lalu Prasad. In an apparent reference to Modi, Sinha said, "People have called your bluff and understood your hollow promises. You have been exposed." Sinha said the BJP has now been "exposed" and people can see through its "hollow" promises. "It's with a heavy heart and immense pain that I finally bid adieu to my old party, for reasons best known to all of us, on 6th April, which also happens to be the Sansthapna Diwas (foundation day) of BJP. "I don't hold any ill will for our people as they were like my family and I was groomed in this party," Sinha later tweeted. He alleged that, like BJP's founding member L K Advani, other stalwarts including Jaswant Singh and Yashwant Sinha were not given respect and not "treated properly" in the party. He also attacked the Modi government, alleging, "Everything happens from the Prime Minister's Office... ministers can't work freely." Terming demonetisation as "probably the world's biggest scam", Sinha said, "It was a mindless decision... Several people died and we were told it was normal." Sinha also said the country would have transformed if the money splurged by the BJP on its publicity campaign was spent on development. Lauding the Congress's proposed Nyuntam Aay Yojna scheme, he said the country has not seen such thing in past. "I am hopeful that the Grand Old National Party which I'm stepping into, will provide me with opportunities to serve our people, society and nation in terms of unity, prosperity, progress, development, and glory," he also tweeted. He hailed the Congress as a "party of great nation-builders and luminaries like Mahatma Gandhi, Nehru, Patel and many others" and exuded confidence that the grand alliance in Bihar will emerge victorious. "Under the present President of Congress the very dynamic, able, tried, tested and successful face of today and tomorrow's India, Rahul Gandhi, I hope, wish and pray that I'm heading into a better direction. Long live democracy and the Congress party, along with the alliance of Lalu and Tejasvi's RJD. Long live our great India. Jai Hind," he also tweeted. 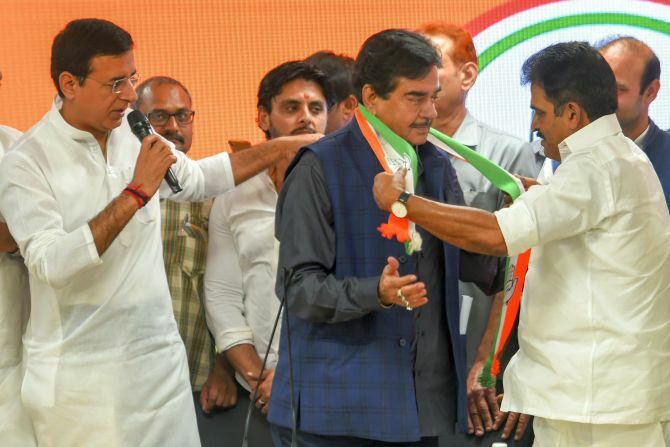 Congress general secretary K C Venugopal, chief spokesperson Randeep Surjewala and AICC in-charge for party's Bihar unit Shaktisinh Gohil welcomed Sinha into the party fold. Venugopal said Sinha was "in wrong party" earlier and has "now joined a right party".